A new documentary finds that Robert E. Lee, the beau ideal of the Confederate officer and gentleman, also represented some of the less savory aspects of the Lost Cause. The thing about Robert E. Lee is that he’s practically the poster child for what a general is supposed to look like. The trim white beard, the noble brow and piercing gaze, the way he sat erect upon his famous horse, Traveller. The aura the man projected was noble, upright, almost saintly. But as Robert E. Lee, a documentary being broadcast Jan. 3 on PBS’ American Experience suggests, he was something else entirely: a reactionary slave owner whose overweening ambition helped destroy his homeland and kill a generation of young men in the process. Guaranteed not to warm the cockles of many Southern hearts, especially those who believe in the myth of “The Lost Cause,” Mark Zwonitzer’s film is a mostly turgid recap of Lee’s military career, filled with the usual gaggle of historian talking heads and archival footage. Where it really distinguishes itself, however, is in its refusal to play down Lee’s more unsavory aspects. And there were plenty of them. A son of Southern aristocracy — his father was Revolutionary War hero "Light Horse" Harry Lee — Lee married George Washington’s great-granddaughter, thereby inheriting a plantation and nearly 200 slaves. Described in the documentary as a “slavery apologist” who had “moral qualms” about the Peculiar Institution, he nonetheless felt it was OK to buy and sell other human beings, which is one reason why he gladly paid to have runaways captured and whipped. He was also a traitor. Educated at West Point, Lee served with distinction during the Mexican War, but when offered the command of the Union Army shortly after the Confederates fired on Fort Sumter, he declined and accepted a leadership role in the Confederate Army instead. A man who never questioned the values of his class, one reason Lee took up the sword for the eventual losing side was because he believed in the “pure, Christian, white commonwealth” the Confederacy was meant to become — a commonwealth in which poor whites and enslaved blacks played secondary roles. Was Lee brave? Yes. An innovative tactician? Sure. Did his troops love him? Yes, again. But the carnage he helped promote in pursuit of a racial agenda set back the South’s economic and cultural progress by decades. And there are some areas of Dixie that still haven’t recovered. It’s important to remember this in 2011, the 150th anniversary of the beginning of the Civil War, when historical revisionists and racial reactionaries will be throwing around terms like “state’s rights,” “glorious cause,” “Northern aggression” and other phrases to describe the poor, doomed Confederacy and its brief, shining moment of glory. Don’t buy any of it. As this PBS documentary shows, the war in the South was promoted by slave-owning plutocrats determined to protect their own economic interests, Robert E. Lee being one of them. Coming together, not breaking apart, is the subject of After the Wall — A World United, a fascinating look at the reunification of Germany, which debuts Jan. 17 on PBS. Writer/director Eric Stange’s film, which follows June’s The Wall — A World Divided, shows the delicate political maneuvering that brought about European, American and Soviet acceptance of the new Germany, and focuses on the three political leaders — George H.W. Bush, Helmut Kohl and Mikhail Gorbachev — who helped nurse it along. A scene from "After the Wall — A World United"
Although legal reunification occurred less than a year after the fall of the Berlin Wall on Nov. 9, 1989, the process was fraught with peril. Concerned that a united Deutschland would be a economic and political threat, former adversaries England and France were wary of German unity. Beset by hardliners, Gorbachev had to tread carefully when dealing with the dismantling of the Soviet Empire; Bush, realizing that Gorbachev was in a tight spot, refused to crow about the fall of the Wall, insisting German reunification was solely a German matter. There was also little doubt that Kohl supported the merger, but, aware of geopolitical concerns, he took a cautious approach to the procedure. In the meantime, East Germany was undergoing a shattering makeover. In the first week after the wall fell, 9 million East Germans traveled to West Berlin, where they gawked at the affluence they had been denied for decades. Free elections, the first ever, were scheduled for March 1990. Stasi headquarters were stormed by a mob, which discovered the spy files the notorious agency had been keeping on its citizens. And state-owned industries were either privatized or closed down, which led to at least 2.5 million industrial jobs being lost. Ultimately, reunification became like a tsunami that could not be ignored. 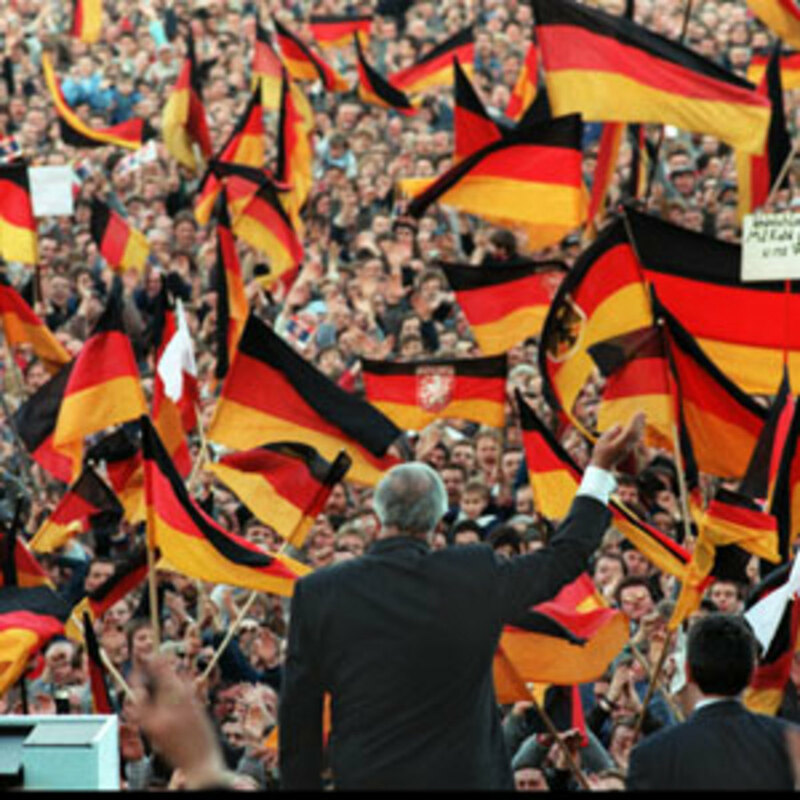 When elections were held in East Germany, economic issues predominated, and the conservative parties backed by Kohl won. Then the East Germans were allowed to trade in their worthless currency for Deutschmarks. And in May, 1990, during a summit in Washington, Gorbachev agreed that a united Germany could freely choose which military alliance it wanted to join, whether NATO or the Warsaw Pact. On Oct. 3 of that year, unification became official. After the Wall — A World United acknowledges that the ensuing 20 years have been bumpy ones. Integration has not been an easy process, both economically and philosophically. In fact, there are those who think it might take another generation before the distinctions between Ossies and Wessies completely fade away. In the meantime, this film shows how historical forces, shaped by three cautious men, helped bring about world-shattering, nonviolent change. Documentary film "Making the Boys" recounts the rise, fall and redemption of the groundbreaking and controversial play, "The Boys in the Band." Author and now documentary filmmaker Sebastian Junger brings AfPak to the big screen with polish and pathos in "Restrepo." As Brazil prepares to host two high-profile global events, filmmaker José Padilha suggests that while improving security is a worthy goal, its methods and rationale are deeply flawed.